The diet is based on results of a 12 week study of over 100 overweight women that showed that a high protein, low fat diet produced superior results compared to a high carbohydrate, low fat diet in regard to weight loss and general health improvements. The CSIRO diet was designed not only to promote weight loss but also to support the optimal health of the dieter and is carefully planned so as to supply the nutrients needed for immune function, bone strength, and high energy levels as well as to reduce the risk of chronic conditions such as cancer, diabetes, and cardiovascular disease. Even though it is a high protein diet, it differs in many respects from other well-known diets such as Atkins and Protein Power in several ways. The CSIRO diet has been described as carbohydrate limited rather than low carb as it contains low glycemic index carbohydrates such as bread, cereal, yogurt, fruit, and vegetables. While the Atkins diet aims to restrict carbohydrates almost completely the CSIRO diet includes carbohydrates in order to keep energy levels up by stabilizing blood glucose. The Atkins diet is also high in saturated fats while being low in essential fats. The CSIRO diet avoids this imbalance by allowing only lean meats and low fat dairy and by including at least two serves of fish weekly in addition to other sources of healthy fats in moderation. Lean beef, lamb, or veal for dinner at least 4 times a week. Fish for dinner twice per week and chicken one night per week. Lean protein (meat, poultry, or fish) for lunch every day. Two eggs may be substituted twice per week. Wholegrain bread – two slices per day. High fiber cereal – one serve per day. Fresh fruit – two serves per day. Vegetables – up to 2.5 cups per day with an extensive list of ‘free’ vegetables that can be consumed in unlimited amounts. 3 teaspoons of fats and oils per day such as olive oil or margarine. Alternatively 2 oz avocado or 3/4 oz nuts are the equivalent of 3 teaspoons of oil. Low calorie soup – one optional serve per day. Wine – two glasses per week. Other foods that are permitted in unlimited amounts include diet soda, tea, coffee, cocoa, bouillon, diet jelly, fat free salad dressings, artificial sweeteners, pickles, ketchup. Dieters are encouraged to engage in at least 30 minutes of exercise each day both for its weight loss and general health benefits. Those who don’t enjoy structured exercise are advised to increase daily activity however possible. These exercises can be used with the CSIRO Diet. 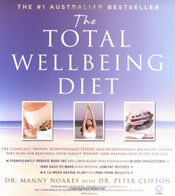 The CSIRO Total Wellbeing Diet retails at $34.95 Australian dollars. There may be an increase in grocery expenses due to the requirement for large amounts of meat and seafood. High protein diets help to reduce appetite between meals. High protein low fat diets show a significant advantage for improving blood cholesterol profiles. Easy to follow when eating out. Provides 12 weeks of daily menus with recipes. Includes tools to measure daily servings so that the diet can be easily adapted to suit specific needs as well as tools to track progress with the diet. Includes a detailed maintenance plan for when dieters have achieved their ideal weight. Not suitable for vegetarians or those who prefer not to eat a lot of meat. Some of the recipes may be time consuming to prepare. Recommends the use of artificial sweeteners and margarine, which is against the health promoting philosophy of the diet. Little information is provided regarding psychological factors involved in dieting and overeating. The CSIRO diet is balanced and could be easily sustainable by most dieters as a lifestyle approach for weight management. The high amount of meat recommended may slightly increase the risk of certain health conditions however this is probably insignificant when weighing up the alternative risks that are associated with obesity. There are patented margarine blends that are non-hydrogenated and trans-fat free. I see this comment constantly in diet reviews about how bad margarine is and that if only we had known it was worse for us back in the 1980s, nutritionists would have gone on recommending butter (since saturated fat vs. trans fat is the lesser of two evils). That sentiment negates the fact that for 10 years now we have had many choices of margarines that do not contain ANY of the offending processes. When are diet reviews and nutritionists going to start drawing these valuable distinctions? Personally, I prefer Smart Balance because it tastes more buttery than any other margarine that I’ve tried. I bought it because it was heart healthy; I stick to it because it has a superior flavor and you can continue baking with it just like ordinary butter. And no, I do not work for or represent a margarine company. I just like the “facts” to be factual.